1. I catch myself smiling a lot at Floydfest like I do in the garden at home. Every whimsical encounter and seemingly random exchange with others feels like a line up of destiny and adds to the whole of the enchantment that makes the festival weekend special. 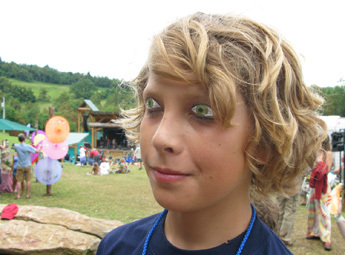 The picture above is of Floydfest founders Erika and Kris's son Tristen, who showed us his new twist on face painting. Can you guess? A second pair of eyes has been painted on his lids and his eyes are really closed. 2. Gaffs and laughs are part of the Floyfest fare. 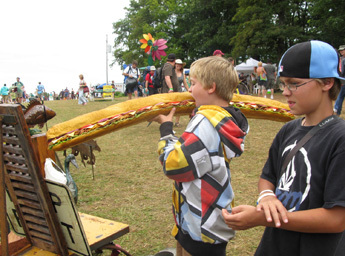 You never know what you're going to see next, like my nephew Patrick pretending to eat a giant fake sandwich. 3. And this line-up I caught without knowing it. 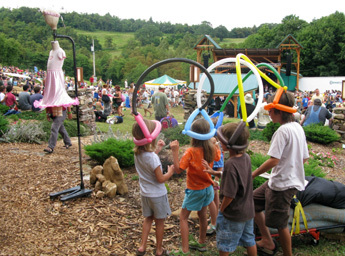 Check out the person walking under the dress mannequin, making it come to life, as a group of balloon headed kids look on. 4. Trish and I stopped to hear this troubadour play the fiddle. We learned that he was 12 years old, his name was Nathan Hairfield and he's been has been playing for six years. "Hairfield? Not Hatfield? That's an unusual name. I've never heard it before," Trish said. "It's not so unusual," I responded. "I know someone else with that name. 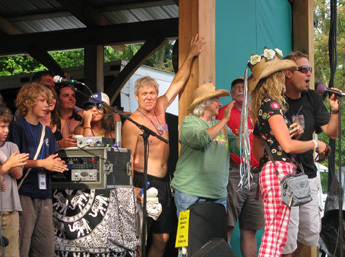 You know the woman who publishes Natural Awakenings, the magazine I wrote the Floydfest story for, her name is Stacy Hairfield." "Yeah, she's my mother," Nathan said. So yes, it's a small world at Floydfest after all. 5. There never seems to be enough time to hear even a quarter of the music offered. So I usually sample what I find myself in close proximity to. But listening to Railroad Earth this year was like enjoying a full course meal. 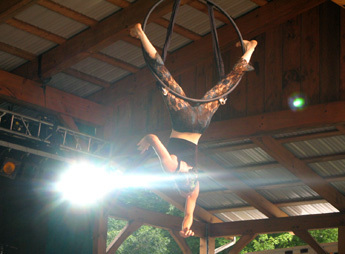 The show was preceded with a stage talk on the greening of the planet and then went into a performance by Spiral Hoop. 6. With lullaby vocals, lyrics that give me goosebumps, and rocking guitar riffs that make me scrunch up my face when I dance, the music of Railroad Earth just won't be put in a box. From the new Streamline Timber front of house where the Hill Holler stage music is mixed, I got an offbeat perspective and one of my favorite shots of day. 7. After the Railroad Earth set, Kris and Erika came on stage and bid us all a bittersweet farewell. The staff took their bows and got some hoops and hollers for pulling off another successful festival. Watch a video clip HERE. 8. I recall the early days of Floydfest and the weather, the hurricane the first year and another year when it was so foggy and cold that I wore a jacket and wool hat. This year was mostly sunny, not too hot, and often breezy. A few hard showers came and went, bringing rainbows. When Trish and I were on stage dancing to Donna the Buffalo, she noticed that people were pointing and we didn't know why. 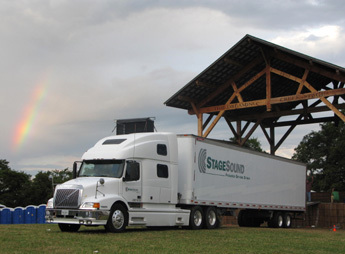 We missed the sweeping rainbow they were seeing behind the stage but caught this one at the end of the final day. A charmed ending for a extraordinary festival, wouldn't you say? Postnote: More on Floydfest 8 REVIVAL HERE and HERE. This festival looks like it grown quite successfully over the years for such a small community. 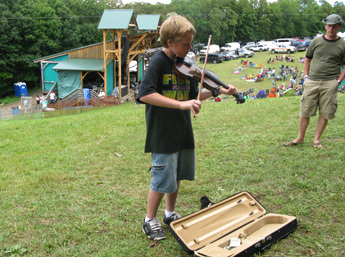 Floydfest is held on the Floyd Patrick County line but people come from all over. Estimated attendance last year was 12,000. This year is likely to be similiar. Every year I say..."Next year, I'm going to go to Floydfest", and yes, I'm saying it again. To answer your question - yes - it is the ARE camp. My grand kids love it as much as their parents did. My oldest granddaughter (14), who is a real spoiled princess said that camp was such a beautiful experience that it made every place else in her life disappointing.